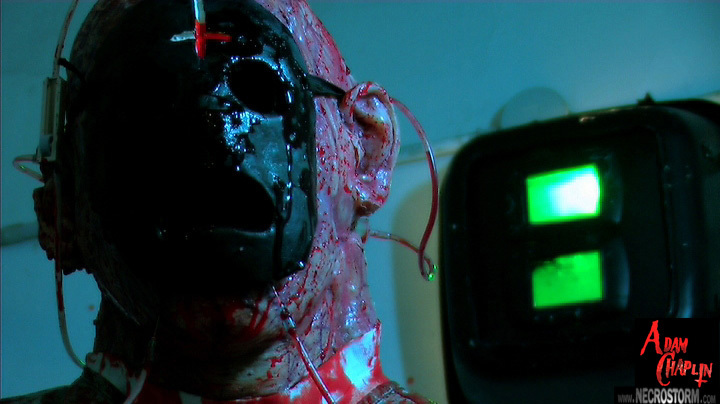 ADAM CHAPLIN: VIOLENT AVENGER: Cyberpunk Splatter As Self-Expression – Schlockmania! The experienced genre fan walks into an underground genre flick knowing they’re going to have to deal with a variety of deficits from the start: the production values, performances, filmmaking techniques and special effects will most likely be iffy in quality. However, the best case examples of the form can rise above such hurdles with a sense of style and a few sparks of inspiration that can allow you to look past the obvious flaws. Adam Chaplin: Violent Avenger succeeds as one of those best cases because it informs its cut-rate excesses with a disarming amount of passion for what it is doing. The storyline for Adam Chaplin: Violent Avenger is a little slippery to grasp as it is told in a fragmentary style and doesn’t bother with a lot of exposition. It takes place in an unexplained post-apocalyptic setting where mutated survivors wander around the ruins of “Heaven Valley,” a city whose only source of order comes from its police force. Said force is run by Denny (Christian Riva), a deranged, hideously deformed crimelord who uses brutality and blackmail to maintain in his power. However, Denny soon finds his reign challenged by an enemy he couldn’t have anticipated: Adam Chaplin (Emanuele De Santi). Chaplin’s girlfriend was burned alive by Denny and his thugs – and Chaplin has enlisted some sort of supernatural being to help him get revenge (said being actually pops up from a wound in his shoulder like a giant worm and talks into his ear!). This possession gives Chaplin superhuman power to rip people apart bare-handed or punch them into puddles of gore – and he will use both powers to the nth degree as he tears through the Heaven Valley P.D. 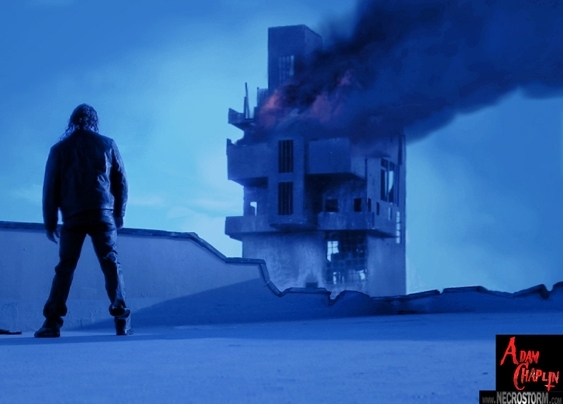 Adam Chaplin: Violent Avenger has quickly picked up a cult following amongst the grindhouse cognoscenti and it’s easy to see why: it’s got a wild storyline that mixes all sorts of diverse influences – post apocalyptic sci-fi, anime, The Story Of Ricky, etc. – and it delivers splattery fight scenes by the fistful, particularly in a final reel that spews epic amounts of gore. It’s also interesting to note that it is totally serious about how it pursues its storyline – there’s none of the campy, “wink at the camera” nonsense that contaminates so many attempts at nuevo-grindhouse fare. De Santi is the driving force behind the mayhem, having written and directed the film in addition to starring as the titular figure. He’s effective, having the chiseled muscles necessary to convince as a super-powered fighter and bringing an appropriate note of emotional desolation to his moody charac ter. As a filmmaker, he’s clearly working out his chops here: his pacing is erratic in spots and the script loses focus during its second act, giving a little too much time to a subplot involving a fighter that Denny blackmails into going after Chaplin and devoting too little detail to Chaplin’s past, leaving him a little sketchier as a character than he should be. That said, the missteps are easy to forgive when one considers just how much De Santi achieves on a pocket-change budget here. He actually makes the cheap video cinematography part of his aesthetic, using its low-res qualities to blend together a novel mixture of computer graphics and practical splatter effects. Similarly, his gritty mixture of handheld camerawork and jittery editing give the fight scenes have a raw, kinetic fury. This punchy style makes the comic-book overkill of the fights feel downright exhilirating (it’s the kind of film where each death-blow is punctuated by a massive spurt of blood). Best of all, De Santi suffuses the film’s world with an unapologetically weird and moody style that makes the whole film hypnotic. 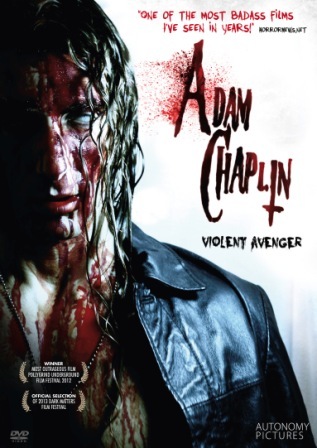 His blend of artsiness, splatter and unforced eccentricity is not for all tastes but Adam Chaplin: Violent Avenger has a distinctive personality that makes it a little more than the sum of its parts – and it is likely to hit a nerve with those who like their cinematic strangeness heartfelt in a demented sort of way. DVD Notes: This film just made its DVD debut in the U.S. via a disc from Autonomy Pictures. It features an anamorphically-enhanced widescreen transfer of the film that does well by its gritty, low-res video look and includes both English and French subtitles to accompany the film’s Italian language soundtrack. In terms of extras, there is a gore-drenched trailer and four short EPK-style clips ranging from one and a half to three minutes in length. The first three are devoted to aspects of the film’s special effects and, in an amusing touch, the final bit is a montage of De Santi working out to prepare for his bulked-up appearance on screen. All in all, another solid disc of a transgressive cult item from Autonomy.